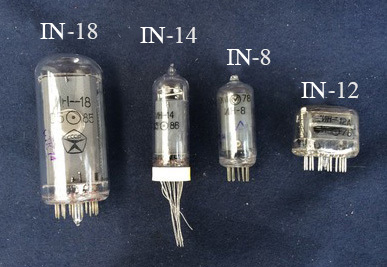 IN-18 Nixie tubes are the main element of AiV Nixie clock. What is the Structure of the Nixie Tube Like? A glow-discharge indicator is an ion device for the information display applying glow discharge. Compared with the single indicator – a neon lamp – it has wider possibilities. The most famous among the glow-discharge indicators are digit Nixie Tube indicators consisting of ten fine metal electrodes (cathodes), each corresponding to one digit or sign, hereby they are switched on individually. The electrodes are arranged in such a way that different digits appear at different depth, unlike the flat display in which all the digits are in the same plane relative to the viewer. The tube is filled with inert gas – neon (or other gas mixtures). When the voltage of 120-180 V DC is applied between the anode and the cathode glow appears around the cathode. The glow colour is determined by the gas composition. The most wide-spread are neon-based lamps with red-orange glow. Nixie Tubes were developed in1952 by the Haydu brothers and later sold to Burroughs Business Machines Company. The name “Nixie” is derived from the acronym NIX 1 — Numerical Indicator eXperimental 1. The name became the common name of the entire line of such indicators and now is used as a generic name. For example Russian IN-14 indicators are internationally referred to as IN 14 Nixie. Starting from the early 1950s and until the 1970s the indicators based on the glow-discharge principle were predominant in the area. Later they were replaced by vacuum fluorescent lamps, liquid crystal and light-emitting displays and now they are quite rare. Currently most of the glow-discharge indicators are no longer produced. The Nixie Tubes were used in the calculators, metering instruments, first computers, aerospace engineering and submarines, in elevator indicators and NYSE information displays. Over the recent years Nixie Tubes have become increasingly popular due to their fancy antique outlook. Unlike LCD’s they emit soft neon orange light. Several companies offer clocks using Nixie Tubes. Wood, steel and acrylic plastics are used for the bodies in these clocks. Usually these clocks have a limited functionality and are used exclusively in their aesthetic function but AiV Nixie clock is a pleasant surprise. They combine an original outlook which will leave nobody indifferent and extensive functionalities to be appreciated by absolutely all the users. There are numerous versions of the glow-discharge indicators: linear (continuous and discrete), sign, segment and matrix ones. 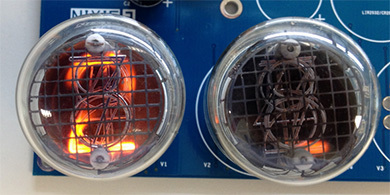 IN-18 Nixie Tubes applied in AiV Nixie are sign indicators. This type of the glow-discharge indicators is probably the most famous and recognizable one. In most cases the term “glow-discharge indicator” refers specifically to them. It is also known that until the early 1970s in the Soviet technical literature these indicators were referred to as the now nearly completely forgotten term “number lamp” was used (in all probability the claque from the German “Ziffernröhre”). Sign indicators are represented as Russian models with the signs as digits: IN-1, IN-2, IN-4, IN-8, IN-8-2, IN-12А, IN-12B, IN-14, IN-16, IN-17, IN-18, with the signs as letters, designations of physical values and other special characters: IN-5А, IN-5B, IN-7, IN7А, IN-7B, IN-15А, IN-15B, IN-19А, IN-19B, IN-19V. Most of the sign indicators are not rarities. In most cases the lamp clocks are made are based on the wide-spread IN-8, IN-12 or IN-14 indicators. These indicators are readily available on the market and their price is not high (US$ 2–5 per piece). Besides, there are numerous international peers to Russian glow-discharge indicators. Traditionally, imported products are more expensive (by factor 1.5–2 for a similar tube) and very hard to find on the market. IN-18 tubes are the largest sign indicators that were produced in the USSR. The height of the digits in IN-18 is 40 mm which is substantially larger than the most wide-spread IN-8, IN-12, IN-14 (18 mm). That large size of the digits in IN-18 makes them well-readable, especially at night and for people with sight impairments. Among the international peers there are tubes with a high digit height, a lot more than 40 mm. For example, the Japanese Rodan CD-47 tube has 135-mm digit height. Finding these lamps on the market is next to impossible and their price exceeds US$ 1,000 per piece. International tubes close to IN-18 dimensions cost about US$ 60 per piece and are rare. The cost of IN-18 lamps themselves is about US$ 30-40 per piece. Though they are a lot rarer than the wide-spread IN-18, IN-12, IN-14 but still they are available, even the new ones from the warehouses in the required quantities. Therefore, the cost of the tubes themselves is about 20 % of the tube watch for IN-18 solutions and even less for the clocks based on IN-8, IN-12, IN-14. Considering the size of the digits, cost and rarity of the tubes, IN-18 tubes are the only optimum solution for making exclusive tube clocks. By and large the application of IN-18 tubes does not differ from that of other glow-discharge indicators but there are some peculiarities. The main one being the fact that due to the design features of the IN-18’s they are subject to the “blue spot” effect to a larger extent than other indicators of smaller size. This effect consists in the occurrence of glowing blue spots in the centre of the tube due to the incorrect lamp actuation. It is this effect combined with the high price and rarity of IN-18 tubes which restricts the application of these tubes by most of the tube watch developing contractors. The point is that 99 % of the tube clock circuits control the cathodes using Russian K155ID1 chip. This chip, including its international peer, is the only special-purpose driver chip for the glow-discharge indicators ever manufactured. Although it is a dedicated chip, it fails to provide correct control of the glow-discharge indicators because the rupture voltage for the chip control outputs is only 60 V whereas it is necessary to switch the cathode voltage of max. 180 V. To protect against fault the chip includes stabilitrons limiting the cathode voltage to 60 V. Therefore, the anode-cathode voltage for a glowing digit is 180 V and for other digits in the tube (not glowing at the moment) – 180–60=120 V which is not sufficient to ionize the gas and produce the glow. 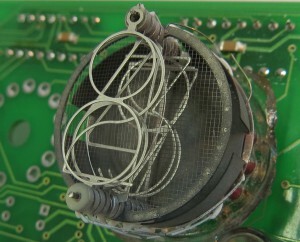 Nevertheless, all the cathodes of the non-glowing digits are energized which produces total mild ionization inside the tube and results in the “blue spots” which is a disadvantage of IN-18’s. In effect, this results from the tube incorrect actuation. In different IN-18 tubes this effect is visually manifested in a different manner and may disappear as the time passes. Though IN-18 without this “blue spot” effect are extremely rare. The correct tube actuation provides complete removal of cathode-anode voltage for the non-glowing digits. To implement this control K155ID1 chip is not suitable because drivers with the rupture voltage of min. 200 V are required. Normally, this control diagram is provided for high-voltage transistors. Then 20 independent components (10 transistors and 10 resistors) need to be installed per each tube instead of one K155ID1 chip. For the clock with 4 or 6 digits 80 and 120 components are required respectively which complicate the assembly, makes the clock larger and makes the diagram impossible to implement: it is required to use only surface assembly components. Just a few clock manufacturers worldwide apply this correct actuation diagram. Our AiV Nixie clocks include the correct tube actuation diagram preventing the “blue spot” effect. One of the engineering disadvantages of the glow-discharge indicator is the fact that the digits are “stacked” – one onto another overlapping one another. Therefore, in case of rare actuation of certain tube cathodes and activity of other ones the particles of the metal sprayed by the working cathodes settle on the rarely used cathodes which promotes their “poisoning”. First it results in the non-uniform glowing of the rarely used digits (occurrence of dull areas), and as the “poisoning” progresses, the portions of these digits stop glowing at all. This defect is common for all the Nixie tubes in which some digits are switched on rarer than other ones. This is the case of the Nixie tubes’ application for the time display: the hours and tens of hours switch over extremely seldom. The classical method of opposing the tube cathode “poisoning” implemented in all the clocks, including AiV Nixie, is the application of different effect for the shuffling of all the digits in the tube (like in a slot machine) when the minutes change. That is, every time the minutes are changed, all the digits are switched over in a round. This method substantially reduces the “poisoning” rate and expands the tubes’ service live. However, many people do not like it when during the minute change the clock switches over digits in a round instead of displaying the current time. Therefore, in AiV Nixie this effect may be switched off, – an alterative method of the cathode “poisoning” reversal is provided. 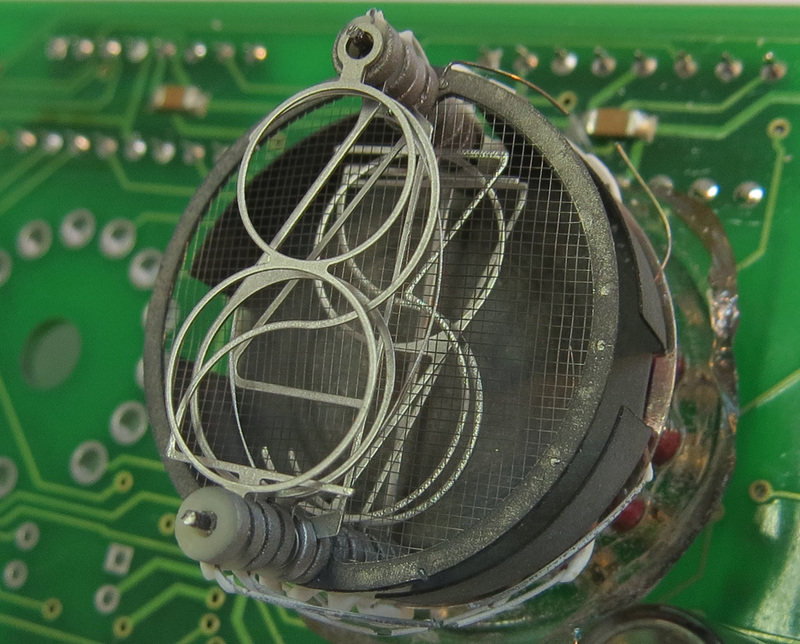 The cathode “poisoning” reversal method applied in AiV Nixie clock makes use of the increased current. It consists in the preheat of the tube cathodes with increased current which results in the cathode self-cleaning and removes the oxides off the cathodes improving the electron emission and recovering the original glow brightness. To reverse the cathodes a special operation mode is provided in AiV Nixie clock which enables the user to perform the IN-18 tube brightness recovery by himself. As per the data sheet IN-18 tubes have the fault-free service time of minimum 5,000 hrs. In continuous operation mode this is only 208 days. A fault is defined as the non-observance of the set values for the following parameters: ignition voltage or indication current for the digits. Despite the short service life claimed by the manufacturer the Nixie tubes in effect work for long years. Certainly, nobody can say for sure how long a particular tube will work, only the manufacturer which set the fault-free service time of 5,000 hrs. It is worth mentioning that the IN-18 tubes have not been manufactured for over 20 years. Brand new tubes manufactured in the late 1970s–early 1980s are quite frequent and they work brilliantly. The long service life of the IN-18’s is confirmed by the absence of complaints over their failure from the tube clock owners worldwide. It is hard to assess the service life of these tubes, even approximately. There are examples of Nixie Tube clocks made as far back as in the USSR time by our fathers still good working nowadays. Therefore, IN-18 tubes are believed to be able to successfully work for a very long time without time. A lot more urgent is the issue of the disappearance of IN-18 tubes from the market: the warehouse stocks from the Soviet times have nearly all expired, new tubes are no longer manufactured. The tube clocks became especially topical in the recent years which resulted in the last years which promoted sky-rocketing of the demand for the tubes. Every year these lamps are harder to get and consequently the price for them grows. Talks of the renewal of the Nixie tubes by private businesses in Russia or launching their mass-scale production in China are going on but no specific actions have been witnessed so far, though, from the standpoint of the present-day manufacture facilities they may be produced as easily as the light bulbs.